Another March, another Boston Seafood Show. Last week, the W&T Seafood team traveled to Beantown once again to learn new industry developments, meet old friends and of course, eat absurd amounts of seafood. It’s the country’s largest gathering of seafood industry folks, many of whom don’t see each other in person during the year, so the conference is always one part business, one part family reunion. This year, conference seminars touched on many old topics, like branding strategies and traceability mechanisms, while exploring newer ones as well, such as Fishery Improvement Projects funded and lead by private businesses. Keynote speaker Soren Kaplan also presented a fast-paced, interactive workshop on innovation, which even included Pop Rocks for audience members! Like previous years, the trade show floor was swarming with activity. 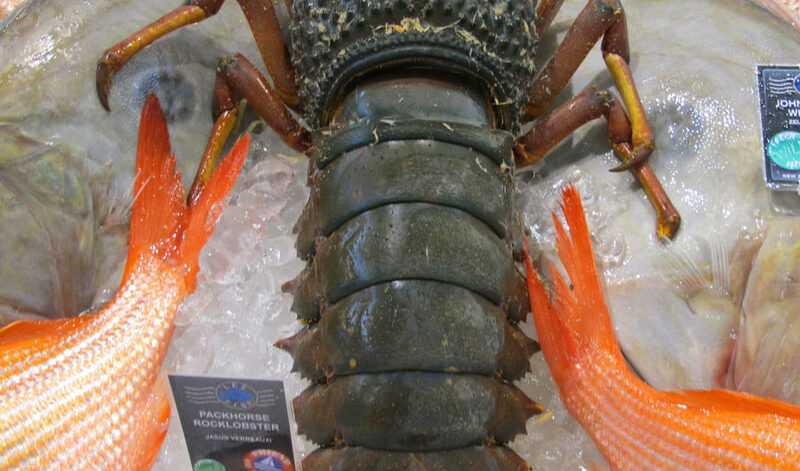 It seemed like there was a greater international presence than last year, with a larger contingent of booths from Asia, where much of our seafood is farmed and processed. 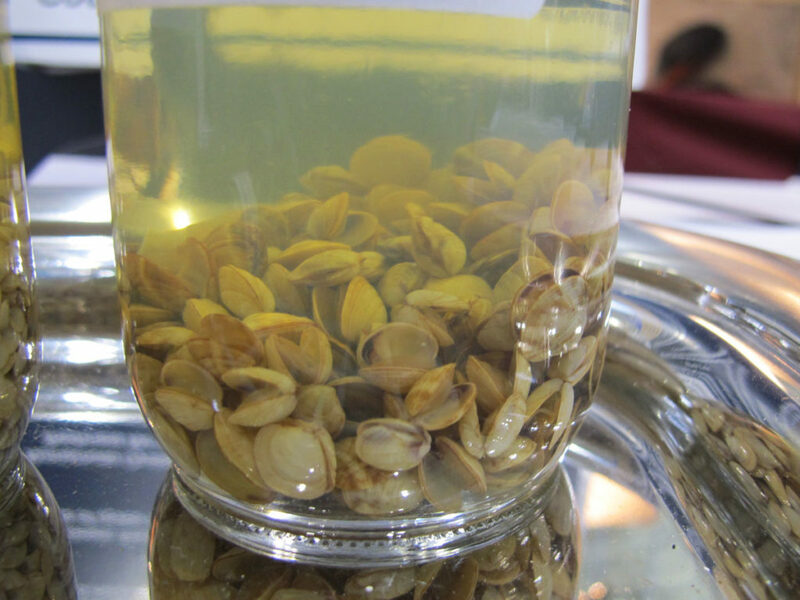 Shellfish farmers were not as prominent or numerous as last year, perhaps because many growers already have sufficient order volumes and are at production capacity. 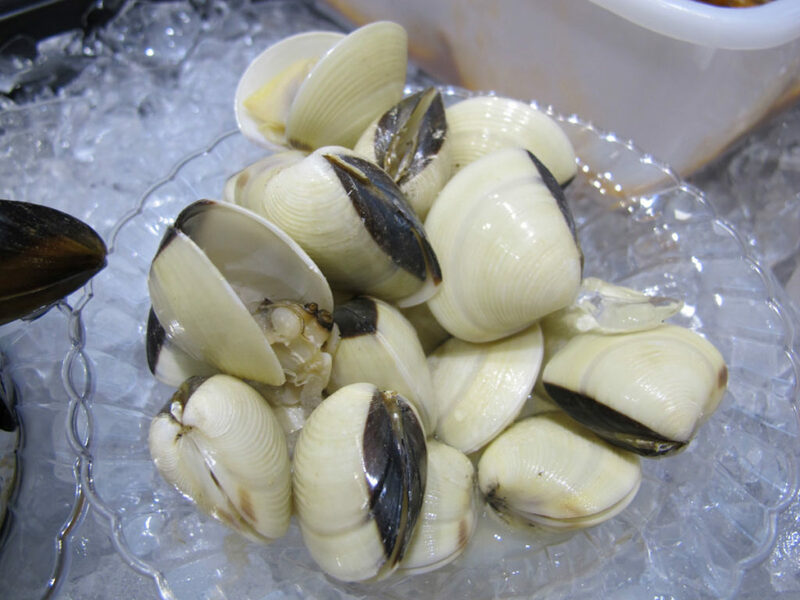 We’re familiar with gray littleneck clams and brown striped Manila clams, but these dainty black and cream Asian hardshell clams (Meretrix lyrata) have a contemporary vibe to them. 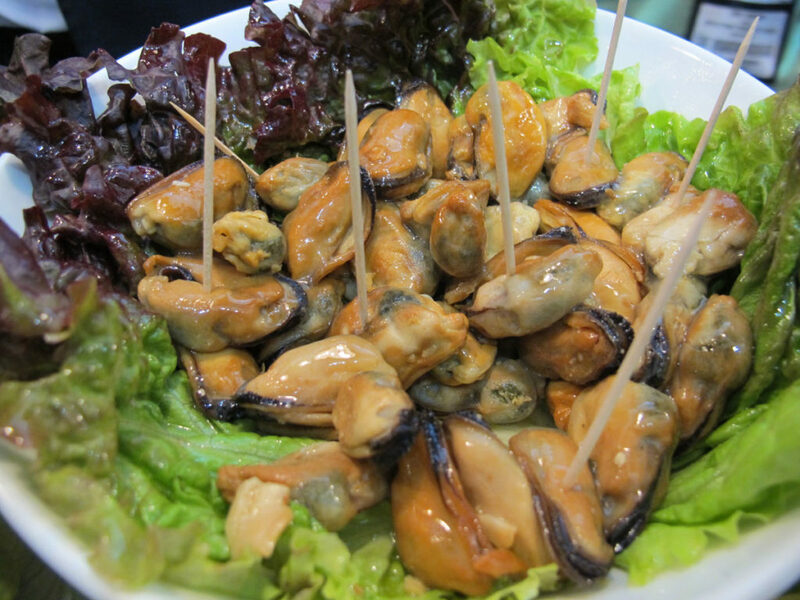 You’ve tried steamed mussels and baked mussels, but what about smoked mussels? They’re great as hors d’oeuvres. 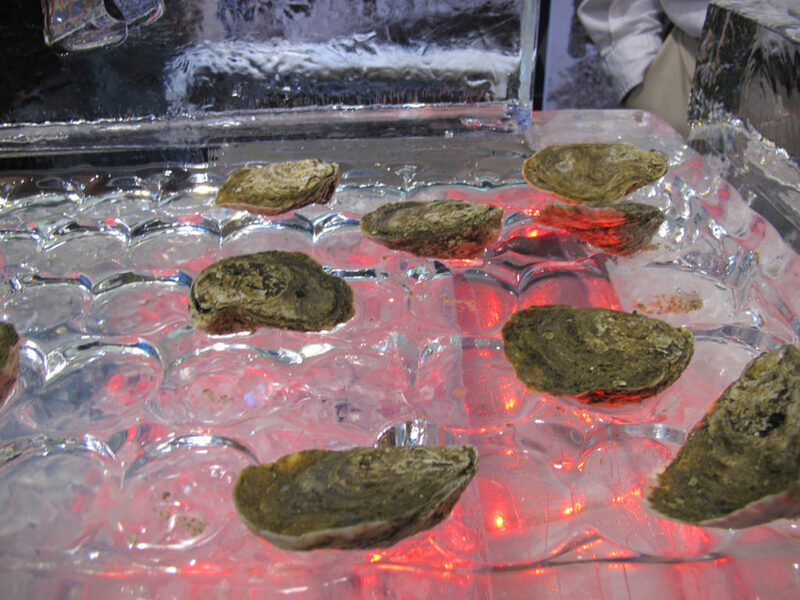 In lieu of coarse salt or shaved ice, this raw bar display makes use of an ice block, customized with carved dips to hold oysters. Plus, it has colorful neon lights underneath to further jazz things up. At the Cherrystone Aqua Farms stall, speed shuckers worked to keep up with the appetites of the crowd. Shucker David Leck was twisting off shells at a speedy clip, though the pace was probably not too stressful for him. 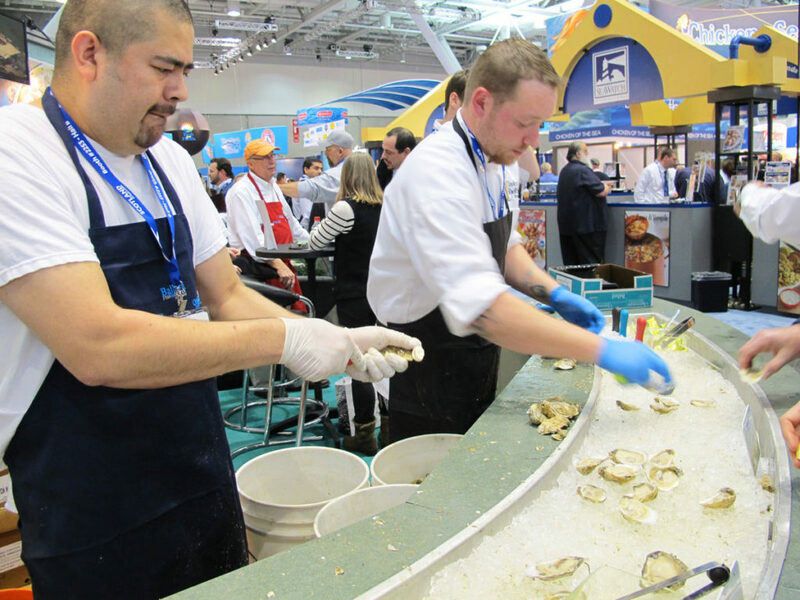 After all, he was the winner of last year’s shucking contest at the Boston Seafood Show. 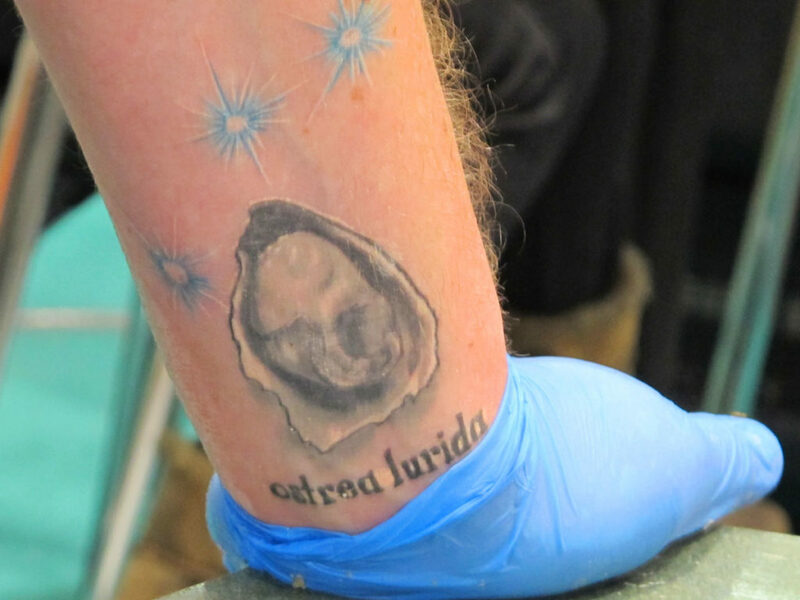 Upon closer inspection of Leck’s arm, we noticed that he has a tattoo of an oyster. And not just any oyster, the rare Olympia oyster of Washington! You’ve seen ice cubes, crushed ice, and ice spheres, but have you seen flake ice? 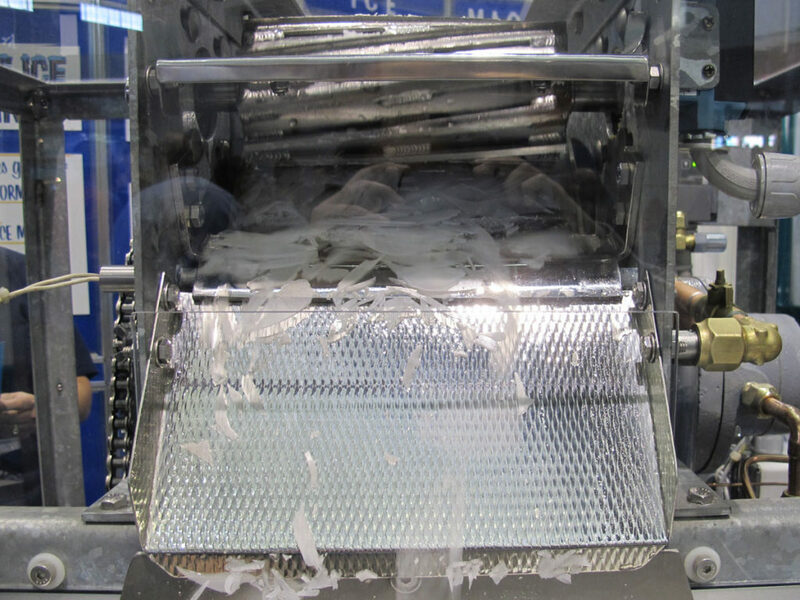 This flake ice machine creates very thin slivers of ice, and allows you to pack seafood with less damage to the product. With the latest studies suggesting that about a third of our seafood is mislabeled, traceability was of high concern at the Seafood Show. 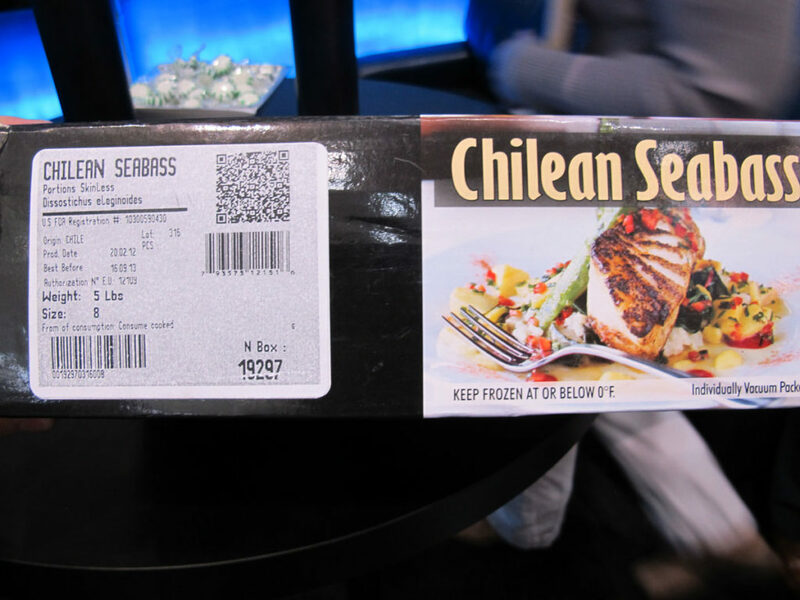 We liked these boxes for Chilean sea bass, which included QR codes to get more information about the product’s origins. 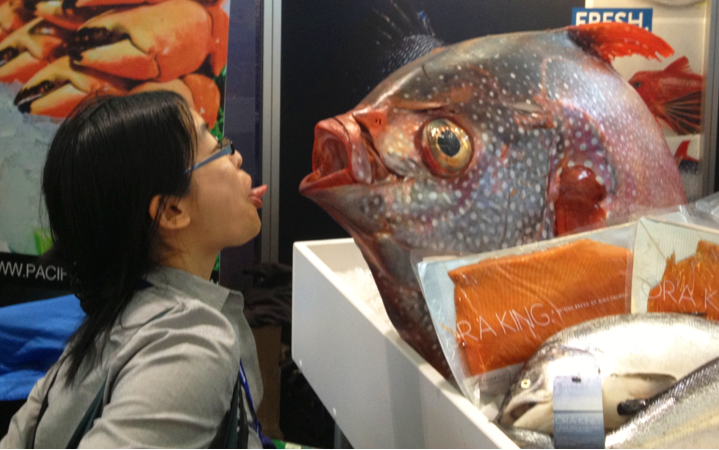 Finally, there comes a time when you must come face to face with a Very Large Fish. That is all.